The Wold Newton War Memorial, situated at the bottom of Hawerby Hill and opposite the Manor gate, was in effect a private memorial put up by the then Squire, William Maurice Wright albeit that he managed to recruit a number of other subscribers to defray the expense. (He loved putting up memorials all over the place e.g. at Scallows the WW2 bomber memorial, the thanksgiving memorial in the churchyard to commemorate his brother Parsons' recovery from illness in1908, stones all around the Manor and Park denoting lost horses and dogs.) His motivation was, perhaps, the death on 22nd November 1915 of his great friend Cyril Compton Jackson (pictured below), five years his senior, whose father had been rector of the parish between 1875 and 1895, during William's childhood and adolescence. Cyril had been in the army for 27 years and it was 20 years since his family had left the village. Squire's diaries record a payment of £15 in March 1921 for 'War Memorial' (in his 'Charity Account'), and a payment of £10-10s to 'Scargill' for foundations, earthworks and the retaining wall. He notes in his diary paying 'Thompsons' for the War Memorial, but there is no indication of where they are from. On 26th November 1920 he goes on a train journey for the day to Peterborough, and records seeing 'our cross' which he thinks 'most beautiful, perhaps a trifle small'. The next day, whilst riding out round Hatcliffe and Gunnerby, he leaves a 'magazine about War Memorial on Mrs Cockrill', presumably the mother of one of those recorded. A scribbled note on the inside of the cover of the 1921 diary says 'Clipsham stone for Memorial Cross'. The list of subscribers is attached below. The war memorial was unveiled on 5th February 1921 with a service of dedication The service sheet is attached below. Squire records the day as a “still gloomy E. wind day. Looks as though it might rain but doesn't. Very busy day”. After riding out, he brings … from Church and gets the War Memorial wrapped in the National flag. 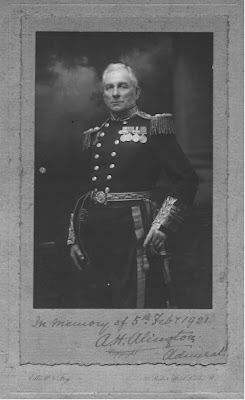 The unveiling was by Admiral Allington of Swinhope Hall (pictured rather resplendently above in memory of the day) and the dedication was by Rev. E. R. Fagan with hymns and prayers at 3.15. Cyril Compton Jackson was one of Squire's closest friends from his youth, and Squire had been best man at Cyril's wedding near Bradford in Yorkshire. Interestingly Fagan was brought up to do the Dedication, and they didn't use Bettison who was by then the Parish priest (arrived 1916?). Squire records Parsons fetching Fagan up to the Rectory before the service, so it may be he was already at North Thoresby by this time. Alfred Addison fetches and takes Admiral Allington. Parsons plays the Last Post on his cornet, 'most impressive'. Almost 20 people go to tea in the Manor dining-room afterwards. His brother, Parsons, records in his diary, "Dull & cold. Very dark. "Opening Day of War Memorial." Meet Dog Fagan at Thoresby at 11-30. Meet Hall at Binbrook at 2 P.M. Opening ceremony at 3-15. Cornet seem to go well. Car Hall back to Binbrook at 5 P.M. Slack about till bed time. Admiral Allington unveiled Cross." During the preceding weeks he made a number of diary entries recording preparatory work for the memorial: 5.1.21 "Busy (with Bill) preparing ground for the War Memorial. Get sign post taken up." 8.1.21 "Help Day to lead chalk for Base of War Memorial." 11.1.21 "Lead some more chalk with Day for the Base War Memorial. Ditto after dinner. Takes us till dark." 12.1.21 "Torrents of Rain most of the day. Get a Rammer made to ram chalk etc. ... Day goes home feeling unwell." 13.1.21 "Stayed here getting the Base ready for the War Memorial." 14.1.21 "Lappidge here fitting Cement Block on War Memorial Foundation." 21.1.21 "Leading chalk etc with Spendlow till dinner for War Memorial. Busy on same foundation for most of day." 22.1.21 "Busy barrowing more soil to War Memorial site till dark." 28.1.21 "Busy with Day leading soil to War Memoial till dinner." 29.1.21"Busy barrowing Earth all morning to War Memorial. Ditto till team." 31.1.21 "Barrowing more earth to War Memorial." 1.2.21 "Busy with Cart leading Road Side soil to War Memorial till 11-30... Get another load after dinner. Then plant trees round same till tea." 3.2.21 "Busy planting some more trees round War Memorial till dark." 4.2.21 "Busy fixing up platform on Memorial till dark." 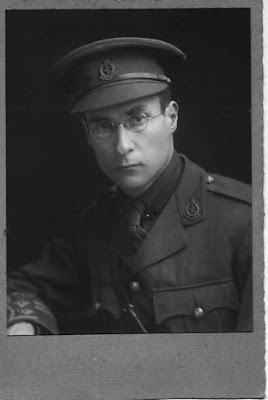 You can find more detail of Cyril Compton Jackson's military career and death at the Battle of Ctesiphon at the website dedicated to the memory of the Bloxham School War Dead, he being a former pupil of the school. Charles Smith, who died in the Boer War in 1900, was presumably included as the only village resident to have died in war. Most of those included from WW1 had presumably lived in or worked in or had some connection with the village at some stage, but were not resident when they went to meet their fate at war. (Farmworkers moved around the area quite regularly.) In his diaries Squire had made no big business about Smith's death, but does record for several years afterwards going to visit Mrs Charles Smith in her house. Presumably, he was of the Smith family buried in the South East corner of the churchyard, the blacksmiths who had the cottages in the middle of the village and the land currently at the South end of the Park. The notes linked here were prepared by Shona McIsaac, erstwhile MP of Cleethorpes. Informative though they are, it's a pity she didn't take the trouble to speak to those of her constituents who could tell her the real background, and explain to her the very vague connection between the village and most of those remembered. For all that, the village did at least get a mention in the House of Commons and consequently featured in the august Daily Telegraph, albeit on the basis of a misrepresentation of fact as, contrary to Ms McIsaac's assertions, the names of the commemorated are legible and the memorial is not in need of restoration - see below. Click here to go to see the Hansard entry on the House of Commons website. William Maurice Wright bequeathed the land upon which the memorial stands to the people of the village in his will.